Facts and history of the life and lifestyles of Native American Indians. There were many different types of American Indian Dwellings. The dwellings were designed to suit the lifestyle of each tribe and were built from the natural resources found in each of the tribe's locations. The climate and temperature also played an important factor in the homes of the tribes and many of the people built different styles of dwellings and shelters to suit both the summer and winter months. The most famous and iconic American Indian Dwellings were undoubtedly the tepee and the wigwam. However, there were many other designs of dwellings which are all detailed in the fact sheet. The life, history and lifestyle of Native American Indians is a varied and fascinating subject. The following fact sheet contains interesting facts and information on American Indian Dwellings. 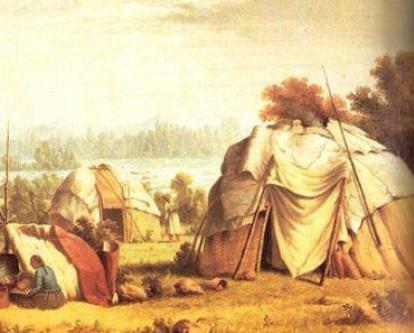 The names and types of dwellings included the Tepees, Wigwams, Wickiups, Cedar Bark Tepees, Wetus, Longhouses, Kiich Houses, Brush shelters, Lean-tos, Barabaras, Earth Lodges, Hogans, Igloos, Sod Houses, Cliff Houses, Mounds, Wattle and Daub Houses, Tule Mat Lodges, Grass houses, 'Beehive' Grass Houses, Chickee (Stilt Houses), Pit Houses, Plank Houses and Adobe Houses (Pueblos). For specific information about each type of these homes and dwellings refer to the section on Native American Houses. American Indian Dwellings Fact 1: The summer and winter homes built by the tribes were highly practical and built not only to provide shelter from the elements but also to accommodate the lifestyles of the tribes. American Indian Dwellings Fact 6: The different styles and designs of dwellings were constructed using a variety of natural resources such as animal hides, birch bark, timber, reeds and rushes, tule mats made from (Southern Bulrush), Cattail or Giant Wild Rye, brush and wattle and daub. American Indian Dwellings Fact 8: The Southwest Indian Indian Tribes, like the Hopi and the Pueblo lived in mud brick houses known as Adobes.